Daymaker (FKA CommuniGift) is a birthday invitation and gift-purchasing platform that enables a child to invite guests to his/her birthday party and have the gifts directed toward a low income or at-risk child. Invitations can be sent and gifts can be purchased without ever leaving the Daymaker site. Daymaker has partnered with local Charlotte non-profits to identify children (a.k.a. “birthday buddies”) who have an upcoming birthday and would benefit from being the recipient of the birthday gifts. The gifts are carefully selected and distributed by the sponsoring non-profit to ensure a proper balance of educational items and age appropriate toy. How do Sports Connection and Daymaker work together? 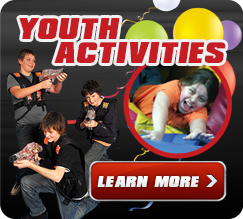 After your birthday party reservation has been confirmed with Sports Connection, go to Daymaker.com to select a “birthday buddy” and to create and send an online party invitation. The invitation provides guests with the option to buy a present for your “birthday buddy” in lieu of bringing a gift. Without ever leaving the site, your guests can get party details, RSVP, read about Daymaker's non-profit partners and seamlessly buy a gift for a deserving child. What if I want to have a Daymaker party but prefer to send out paper invitations? No problem! After your birthday party reservation has been confirmed with Sports Connection, you will still go to Daymaker.com and start the process by selecting a “birthday buddy”. Next, you will choose Campaign Mode. By selecting Campaign Mode, you will be able to generate a special link to share with guests. Guests who follow the online link can purchase a gift for your “birthday buddy” with just a few clicks. So by having a Daymaker party, guests do not need to bring birthday presents to Sports Connection? That is right! Gifts for your “birthday buddy” are selected and purchased online through Daymaker.com so no need for guests to bring anything to the party. Daymaker's retail partners take care of shipping the gifts directly to the sponsoring non-profit who takes responsibility for delivering the gifts to the “birthday buddy”. This confidential approach to gift giving ensures the privacy of our birthday buddies. Do I need to wait until I get final confirmation from Sports Connection to pick out my birthday buddy? No. You can select your birthday buddy and begin setting up your birthday page on Daymaker while you work out the final details of your party. Daymaker will save a draft of your online invitation until you are ready to hit send. Visit Daymaker.com for more information.